Motorized Lift Designs — TRANSFORMING DESIGNS INC. The Transforming Tv Lift - Keep a room elegant and simplistic on your terms. The Transforming TV Lift has the capacity to store your larger flat-screen television with a thin and non-obtrusive design. This cabinet was designed with the feedback of our customers in mind. 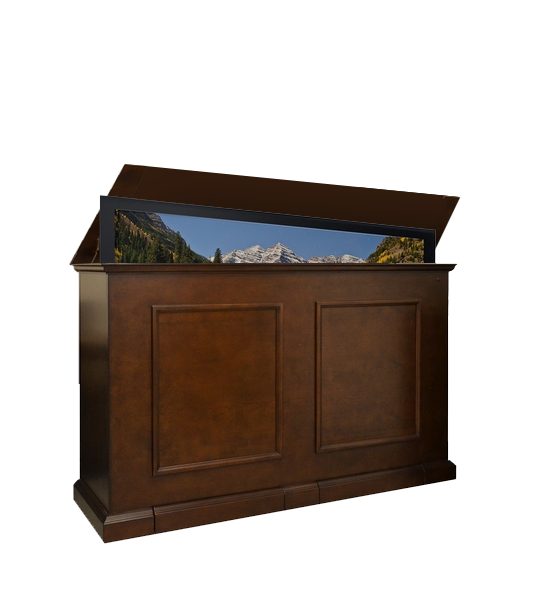 You wanted a cabinet with stylistic features of the traditional Elevate and storage features that would accommodate large flat screens, and we are bringing that to you with the Transforming TV Lift. Designing and manufacturing TV lifts for over 10 years, Transforming Designs builds all components in-house, making sure they are truly 100% functional and working with exceptional performance. The Universal TV Mounting Bracket is build by Transforming Designs and a Truly Universal design. Includes a Universal Remote Control to control not only the function of your TV Lift but the input of your TV. All designs are fully customizable and suited to your exact needs.